Bustling Fifth Avenue in Sunset Park, Brooklyn, has become a battleground for the right to New York City sidewalks. If the Sunset Park Business Improvement District (BID) gets its way, street vendors who sell merchandise and an array of Latin American foods could be forced off the public sidewalks along the busiest stretch of Fifth Avenue. The City Council is proposing legislation that would prohibit all street vending — including general merchandise, food and artists — along Fifth Avenue between 38th and 64th streets. The city Department of Consumer Affairs would issue 80 new licenses for “fixed vending locations” in the new “Sunset Park Vending District,” which would push existing vendors to less commercial streets. The locations will be detailed in a map provided by the Sunset Park BID to the city and would be assigned to licensed vendors who apply to an annual lottery organized by the BID. 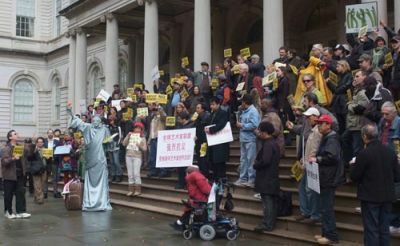 On May 5, the City Council’s Consumer Affairs Committee met, but immediately postponed the hearing and vote on the legislation (Introduction 846-A). Outside City Hall, the group Artists’ Response To Illegal State Tactics (A.R.T.I.S.T.) and disabled veteran vendors protested the bill. The vote has now been rescheduled for May 20. The Indypendent called the Sunset Park BID, but a staff member was not available for comment. REPORTER’S NOTE 5/20/09: THE MAY 20 HEARING WAS DEFERRED BY COUNCIL MEMBER LEROY G. COMRIE, JR., CHAIR OF THE CONSUMER AFFAIRS COMMITTEE.